Notice the “Rest” key that is attached to the right side of the frame. It’s a non-operational key. 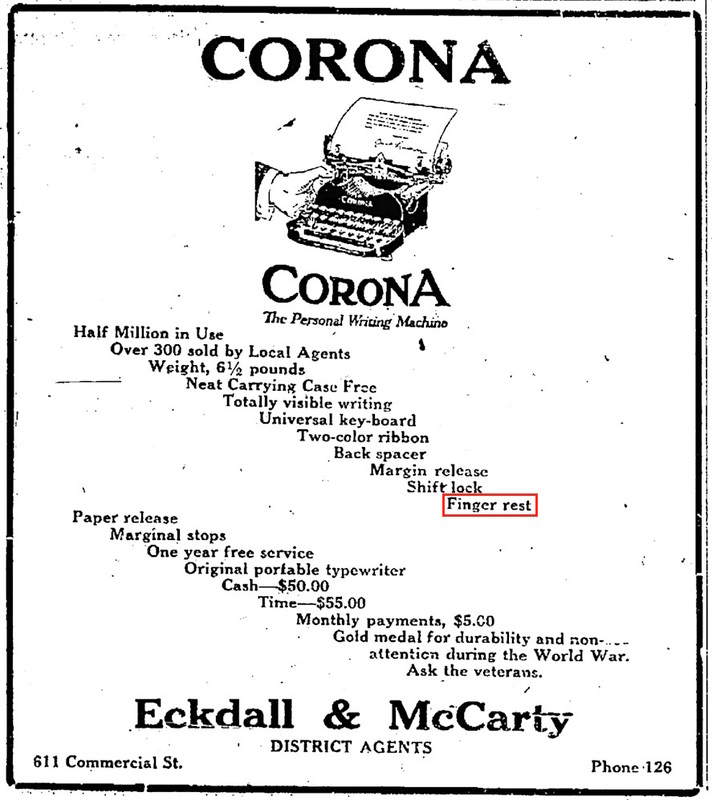 Ernest Hemingway celebrated the Corona 3 with a poem — “…the mill chatters in mechanical staccato…” — but he must have been a two-fingered typist, for a full set of fingers simply isn’t welcome on the Corona 3. Sporting three rows of compact keys, there is no place for the right pinky finger to rest (typically the :; key on a standard keyboard). Practiced touch typists must have agonized over the keyboard, for out of position, one might easily punch “r-g-w” instead of “t-h-e”. In the correct position, the pinky dangles: it does not march with the others. Though highly desirable — and quite rare — the “rest” key is not precisely the “holy grail” of typewriter accessories, as some eBay sellers persist in claiming. 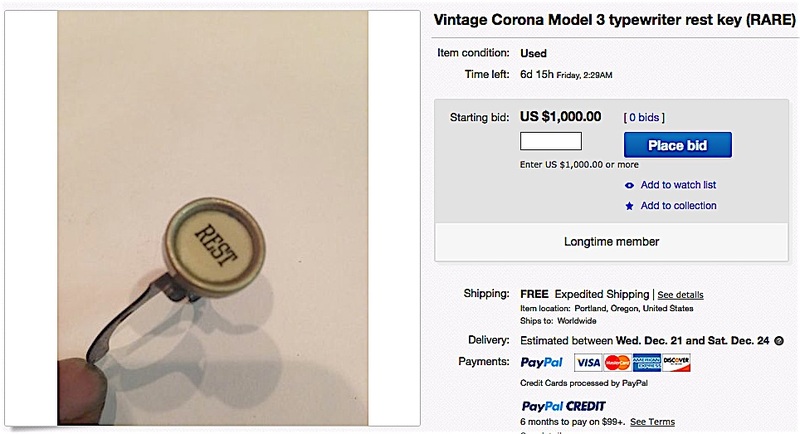 One seller had asked $2,500 for the key, and another offered the key for $1,000. Neither price is remotely realistic — no one is going to pay that amount. Further, Corona 3s with “rest” key appear periodically on eBay and elsewhere and usually garner between $150 and $200, though sometimes more. The accessory is not common, but neither is it particularly uncommon. One is generally available every month or so online, but one does have to keep an eye out. There is a certain logic to the seller’s argument, but a keen eye can locate one of these attachments for a much more modest sum. © 2018 – 2017, Mark Adams. All rights reserved. Thanks for the information on this item. I didn’t realize that it turns up as often as you say. Personally I find folding Coronas quite difficult to use for a variety of reasons, but I don’t think I would be bothered by having to keep my pinkie in the air. It does turn up, but often you have to look for it. Several listings include the rest key in the photos, but not in the description or title. You really have to be looking. I paid around $120 for the machine and case. The rest key was not mentioned, but pictured. Also, yes, it is a difficult machine to use. 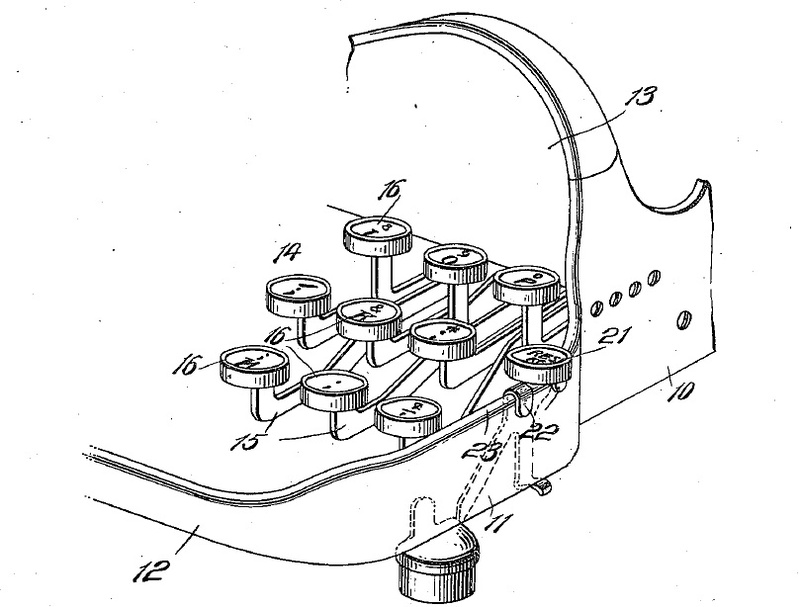 Consumers must really have wanted a portable typewriter to endure this machine. I find it an uncomfortable typer. I’ve always found those listings to be humorous. Like you’ve already said, most of the ones in collectors hands were simply found on machines purchased at standard prices. My own came to me the very same way, after I spotted the key on a very reasonable BIN. I was more thrilled to be able to simply use an early Corona without the floating-pinky effect (being an aforementioned touch-typist, as most today are) than I was to possess something uncommon/rare. The best part of all this is that if they started the bidding at $1 rather than $1000, we would actually get a feel of how valued these are as collectors bid on it. Clearly, market prices are below the $1000 mark the one seller attempted. While the “Holy Grail” may differ amongst certain collector levels, I feel confident enough to say that the general consensus of the Holy Grail of collecting is the Blickensderfer Electric. They are out there for sure. We have a few of them now and have traded a few away. Typically they are on machines “in pictures” but not listed as an item of note. For someone that really wants one, i could see them paying $200-$250. I have seen at least a dozen sold in the last few years but they were rarely noted in the ads. There will always be items out there for people with more money that good sense.